I tend to encourage people to buy bigger than 22″ when considering a monitor for games. That said, these smaller models have a big advantage – they are cheap! And perhaps you have limited space on your desk, a more compact screen can help there. Whilst filed in in the 22″ section, according to their website, this model actually has a 21.5″ viewable area so it’s even small for this category. It really is a no frills piece of kit, it’s hard to find anything to talk about really. I should mention that it is a 1080 full HD monitor so I suppose if you have held back from high def for all these years you could consider this an upgrade. If you are looking to stretch your budget a little, there is an IPS version of this model available. For a budget monitor, the Dell is a smart looking unit. The stand is simple and effective, and not unattractive. The surrounding bezel isn’t the smallest but there are plenty chunkier out there on the market. All in all I wouldn’t be embarrassed to have this on display in my home office. Connectivity is fairly limited with just VGA and HDMI. But VGA support is handy if you are looking for a cheap replacement for an ancient computer that wouldn’t really benefit from a state of the art 4k monitor! I was unable to see any professional reviews of this model, so I can’t share any additional information on colour coverage and accuracy. However a review of buyer feedback suggests that owners have been pleased by what they got for the money. The panel makes use of VA technology which aims to overcome some of the picture quality issues found on the more common TN based screens. 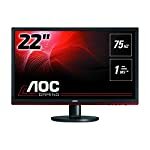 This will give you superior image quality compared to these competitors but it does have a 12ms quoted response time which is relatively slow for in this day and age so this monitor could suffer from latency issues. Is this going to give top notch out of the box gaming performance? No, but you’re not paying for that. Will you get a good well functioning monitor made to Dell’s high standards? Yes. We give the Dell SE2216H a 4.5 out of 5 rating. Want to know what existing owners of the monitor think? You can read real user reviews here. Should I buy the Dell SE2216H? 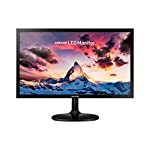 The SE2216H is a very basic monitor that you might buy if on a strict budget. 22" might be on the small side for games, but if you can't afford to go bigger you get what you pay for with the SE2216H. If you are having some doubts about this purchase then why not read some real owner reviews and see what other buyers think. Welcome to the Dell SE2216H FAQ. This section attempts to answer common questions you may have, please get in touch if you have any more queries or if you think our answers need updating. No, I’m afraid to say it has a firm fixed base. As far as I can see there is no VESA mounting compatibility either. You’re stuck with the supplied stand. No included speakers on this model. You’ll need your own speaker setup if you require sound.